It might seem obvious, but management of health and safety in the workplace is very important. Along with protecting employees, it also increases productivity when employees are healthy and happy. OSH (Occupational safety and health) in companies is important for legal, economic, and moral reasons. Managing health and safety at work should be part of the day to day operation of an organisation, and an integral part of workers behaviour and attitude towards safe working. Based upon strong leadership and involving employees with sufficient skill, knowledge and experience who are trusted to work safely, a management system should involve processes and procedures to ensure legal compliance as a minimum standard.We believe that health and safety can be and should be, ‘Hassle Free’. Regardless of organisation size or type, the best health and safety management systems apply a systematic approach based on a thorough understanding of the specific hazards and risks the organisation faces on a daily basis. A systematic approach would include the four steps, Plan…Do…Check…Act applied in a continuous cycle and looking to achieve continuous improvement. Plan – a policy should be drawn up involving detail regarding organising and arranging for health and safety implementation. 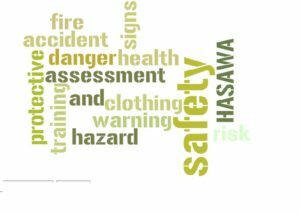 Do – risk profiling, identifying hazards and the potential for injury or ill health and introducing suitable and sufficient control measures to reduce risk associated with the hazards as far as is reasonably practicable. Check – measure performance by proactive checks, testing and observation and investigate after events using a structured approach. Act – apply corrective and preventative actions learned from the outcome of a proactive and reactive measurement. Revisit plans, policy documents and risk assessments to see if they are still relevant and effective, and update and improve them where possible. An organisation may need to repeat the Plan, Do, Check, Act cycle a number of times when first starting out, or when there is a new process or change to existing processes. It is good practice to review a health and safety management system for suitability and effectiveness regularly. More supporting information can be viewed via the HSE website. Alternatively, here at Acorn Health & Safety, we are a leading provider of health and safety consultancy in the South West. Whether you require support with a one-off assessment or a complete health and safety management system we can help with our Hassle Free service. We provide individuals and organisations with practical advice, support and guidance without long contracts. You’ll be given a named consultant, a member of our team who will get to know you and your business and be there when you need them. From risk assessments and policy creation through to accident investigation and audit, we offer a wide range of consultancy services. Our consultants are more than happy to discuss your specific needs. Our ‘Hassle Free’ offering specifically for the construction, building and trades sector includes support with SSIP schemes, a monthly toolbox talk and a named consultant who specialises in this area. email us or call us on 0117 958 2070 for any Health & Safety Requirements .